Krychaw or Krichev (Belarusian: Кры́чаў, Łacinka: Kryčaŭ, pronounced [ˈkrɨtʂau̯]; Russian: Кричев, [ˈkrʲitɕɪf], Polish: Krzyczew) is a city in the eastern Belarusian Mogilev Region. 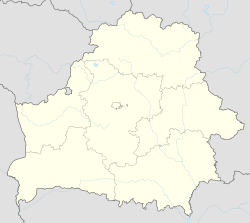 Krychaw is the administrative center of the Krychaw Raion. As of 2009, its population was 27,202. It is located on the Sozh River. Krychaw was first mentioned in 1136. The Soviet Air Force Krichev Air Base was located east of Krychaw during the Cold War. ^ "Численность населения областей и районов: Могилевская ("The population of the regions and districts: Mogilev")" (PDF) (in Russian). Национальный статистический комитет Республики Беларусь (National Statistical Committee of the Republic of Belarus). Archived from the original (PDF) on September 18, 2010. Retrieved 30 January 2012. This page was last edited on 24 January 2019, at 05:13 (UTC).